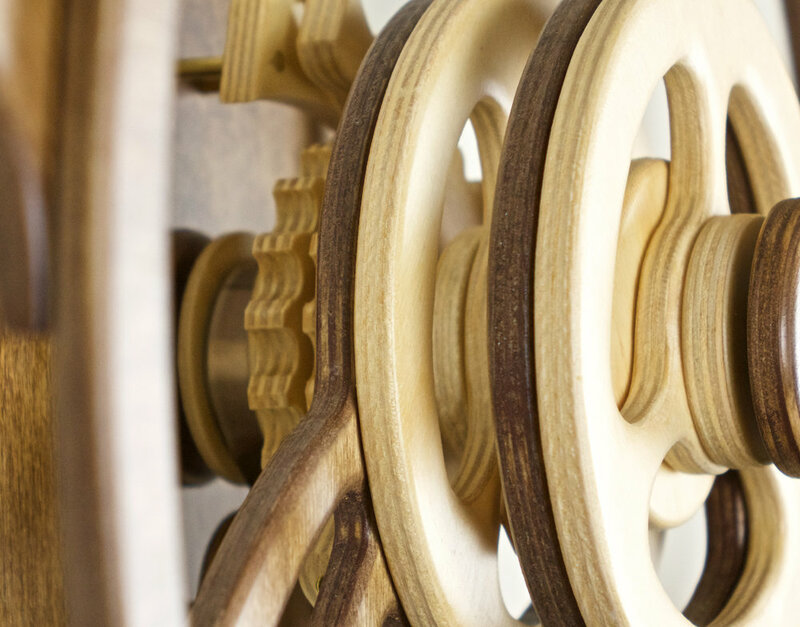 When designing a kinetic sculpture many different types of balance need to be considered. This was especially true with Duality. First there is visual balance. Marji (my partner, wife, art teacher) taught me about visual balance many years ago when I was working on my first sculptures. Basically it is trying to achieve balance in the appearance of the sculpture. Symmetrical designs are visually balanced but can be boring while asymmetrical designs are harder to balance but usually more interesting. Second, there is simple balance. Here each mechanical part of a kinetic sculpture must be either in balance or off balance by a precise amount as related to gravity. Absolute precision in this area is impossible to achieve when working in wood but it is essential in my design to have a clear understanding of the tolerances available in each design. And lastly, I work with what I call patterning balance. I created this term to define the balance I need to achieve between the complexity of a motion and the designs of the individual components (wheels, levers, etc.) within a sculpture. More complex patterning wheels usually require a more restrained motion than less complex wheels to prevent the sculpture from becoming visual chaos. Duality has what I consider a more complex asymmetrical wheel design. In order to fully comprehend the patterns created, the mechanism has to move the wheels in a more predictable way. Alternatively a sculpture like Infinity has symmetrical wheels so I used a more random and unpredictable mechanism to move it. After designing the wheel for Duality I needed to experiment with the various motions I can create to establish the visually most exciting combination. Once I achieve that patterning balance, I have a sculpture! A type of pattern creation that has repeatedly frustrated me is one with wheels moving in the same direction. I knew there was some great potential in this area because I could see glimpses of new patterns when I rotated wheels by hand and on the computer screen. The challenge was to make the wheels move slowly but at different and constantly changing speeds with the goal of producing a kaleidoscopic effect. My first successful attempt evolved into a large fairly complicated one-of-a-kind sculpture called Starscape made in 2007. For the next 8 years or so I dabbled with ideas on the computer and developed several wheel patterns but the mechanism continued to escape me, until last year. 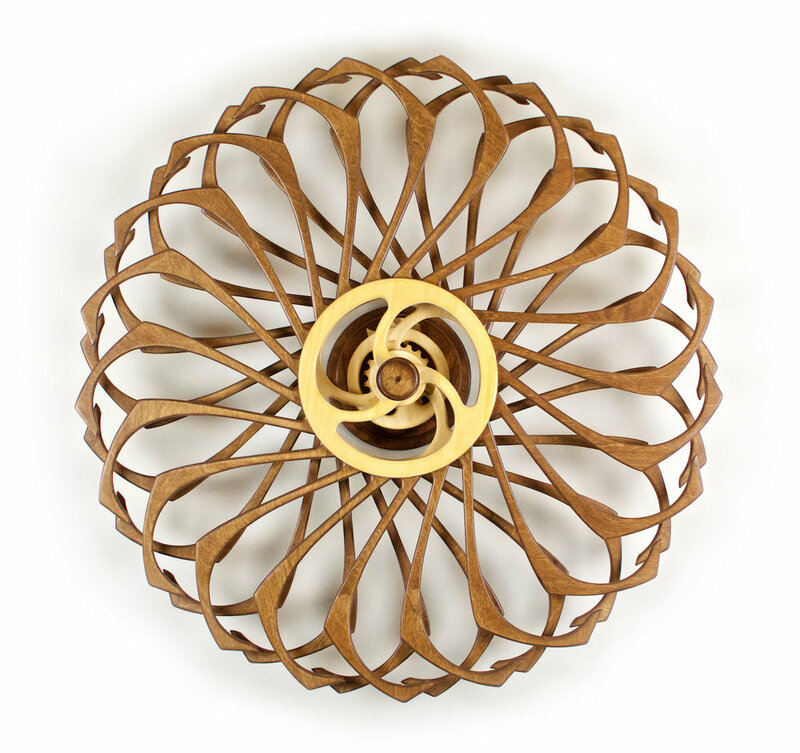 The Kindala - Stars wheel has a relatively simple spoke form set at a precise angle to create a dynamic star burst pattern. During a large part of the cycle the pattern expands peacefully and then for a brief period crescendos into an explosive pattern before settling down to the quiet pattern again. Watch the video and notice the radiating stars.